It is up to traditional department stores like Myer to keep proving their relevance to consumers as omni-channel players as global giants like Amazon come to shake up Australia’s retail market, Myer’s CEO claims. Myer CEO and managing director, Richard Umbers, was asked to respond to questions about the forthcoming launch of Amazon in the Australian market and its impact on local department stores, during the group’s first-half financial result briefing. While suggesting Amazon will face significant challenges bringing its Prime model to Australia geographically, Umbers said it’s “very likely” the whole retail pie will grow thanks to its market debut locally. “Those retailers that have strong online operations in their own right, are likely, even if they lose some marketshare, to grow in that context,” he said. “We believe the most important strategy to ensure we can compete… is to make sure we put omni-channel investment right at the forefront of our investment model. Umbers said Myer’s strong, long-term connection with customers would count, and noted the group’s Myer One loyalty program as an example. “As an established brand with loyalty built up over generations, this is our game to lose,” he continued. “A lot of the stuff we sell, particularly in the fashion market, lends itself to a high-touch, service-driven environment. The fact that we can link our stores to our online environment and drive omni-channel outcomes means the customers get the best of the best from us. The ASX-listed department store giant reported a 0.6 per cent dip in half-year revenues to 28 January to $1.78 billion, but a comparable store sales increase of 0.3 per cent. Q2 sales were down 1.3 per cent to $1.06bn, or 0.5 per cent on a comparable store basis, figures Umbers attributed to difficult trading conditions during January. Net profit after tax rose by 5.3 per cent to $62.8 million, and EBITDA also increased by 2.7 per cent to $142.2m. Umbers saw this as a particularly good result given aggressive competition with heavy discounting before and after Christmas, along with patchy consumer confidence. He noted the shift away from discounting as a group. Another highlight over the first half was a 48 per cent increase in online sales, which Umbers attributed to improve online customer experience. The top performing category was homewares, which lifted by 65 per cent and now represent 10 per cent of total sales online. “This was built on traffic and conversion rate increases of over 20 per cent, and a 6 per cent increase in basket sales,” Umbers said. “Click-and-collect now represents 12 per cent of those sales. Myer has also just struck a new partnership with Afterpay, providing customers the opportunity to buy now but pay later. 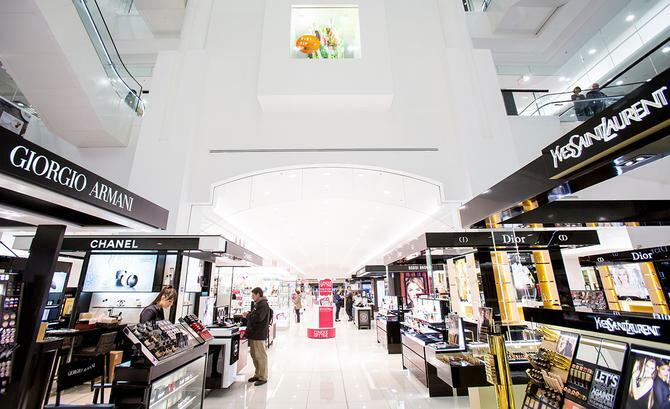 Myer is 18 months into a five-year, $600m transformation program aimed at repositioning the business. The ‘New Myer’ proposition consists of four key pillars: Customer-led offers, wonderful experiences, omni-channel shopping and a productivity step change. As part of this revamp, Myer has introduced a raft of new premium brands and more experiential in-store into the mix. Over the past six months, nearly 700 new or upgraded brand installations have been rolled out across the network, and new brands introduced over the period include Oroton, Saba, Jak + Jones Premium, Radley and John Lewis. “As we enter the next phase of transformation, we are delivering on a number of longer-term initiatives to support New Myer, including an improved omni-channel offer and a productivity step change,” Umbers said, adding a number of the significant initiatives to come are less visible, such as back-end systems, plus the online Myer Academy learning offering for staff.